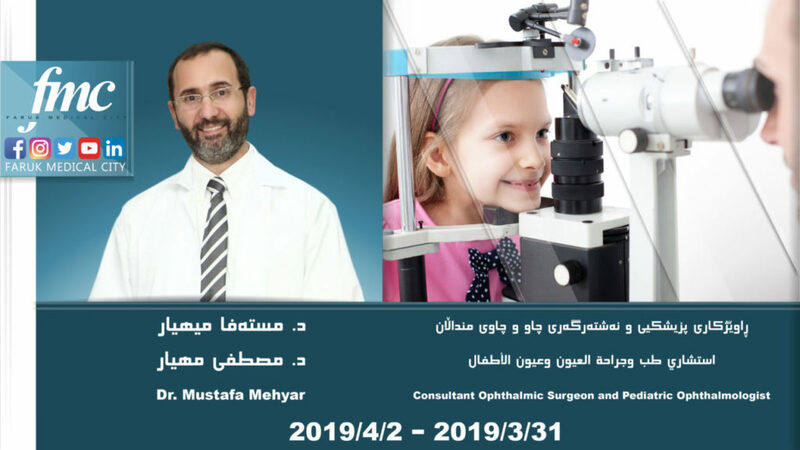 Dr. Mustafa Mehyar, consultant ophthalmic surgeon and pediatric ophthalmologist, head and founder of Ishraq and Mehyar eye center, and member of the First Eye Salvage Program for Retinoblastoma in King Hussein Cancer Center in Jordan, will visit FMC in Sulaimaniyah, Iraq from 31/3/2019 until 2/4/2019. Pediatric Ophthalmology and Strabismus Fellowship from George Washington University, Children National Medical Center, Washington, DC, USA. It is worth mentioning that Dr. Mehyar attended several courses in Ocular Oncology, Ocular Ultrasound, Ocular Pathology and refractive surgery. He has publications in different ophthalmology journals with special interest in Retinoblastoma, Amblyopia, Retinopathy of Prematurity and Strabismus. For booking and more information, kindly contact us via 07709000000. 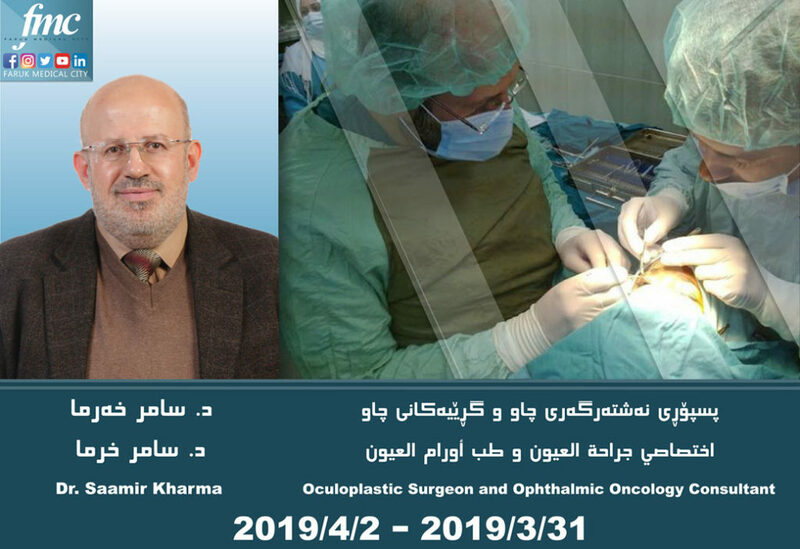 Dr. Saamir Kharma, oculoplastic surgeon and ophthalmic oncology consultant at King Hussein Cancer Center in Jordan, and the former head of department of ophthalmology at Prince Rashid military hospital, will visit FMC in Sulaimaniyah, Iraq from 31/3/2019 until 2/4/2019. The Jordanian Board of Ophthalmology. Dr. Samer has several publications in different ophthalmology journals at the national level, and he participated in several training courses in his area of expertise in India, United Kingdom and USA. 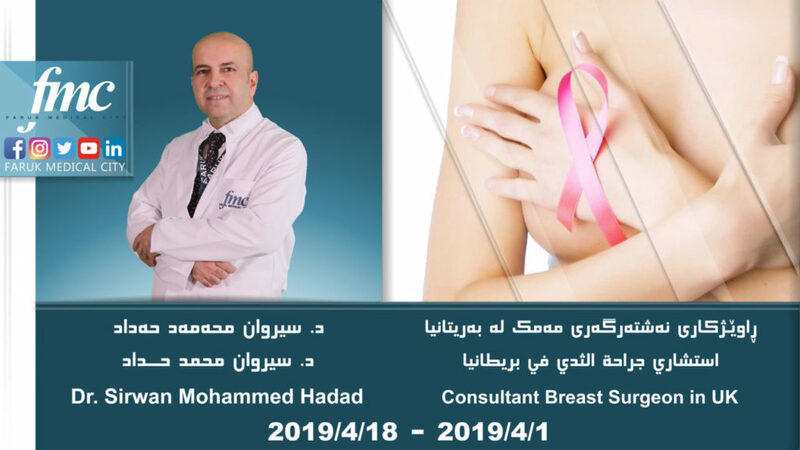 Dr. Sirwan Haddad, Consultant Breast Surgeon and Senior Lecturer in the University of Sheffield, UK, will visit FMC from 1/4/2019 until18/4/2019. During his visit, Dr. Sirwan will see patients who need breast reconstruction after cancerous breast lump removal, who wish to undergo breast reduction and breast augmentation, patient who want to do breast reconstruction after mastectomy, as well as those with strong family history of breast cancer and they would like to consider bilateral mastectomy and immediate reconstruction. For booking, kindly contact us on 07709000000. 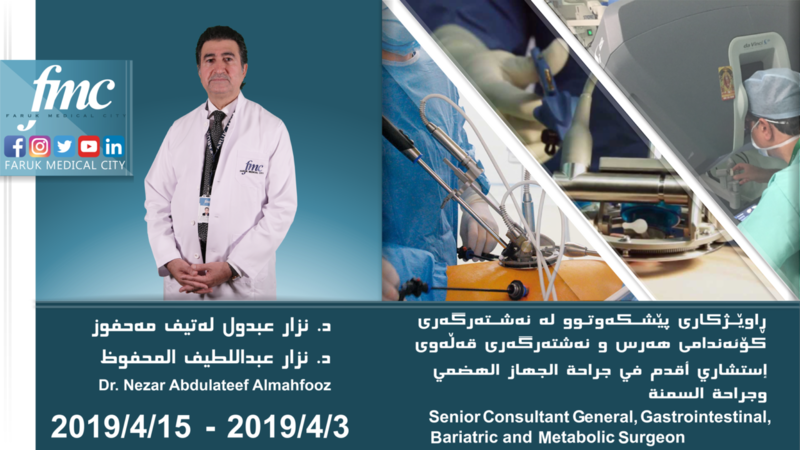 Dr. Nezar Abdulateef Almahfooz, senior consultant general, gastrointestinal, bariatric and metabolic surgeon, will visit FMC to examine patients and perform surgeries from 3/4/2019 until 15/4/2019. International federation of metabolic and bariatric surgery. Dr. Nezar will perform all varieties of advanced metabolic and Obesity surgeries, gastrointestinal tumors, diseases like reflux esophagitis, using advanced 3D laparoscopic technology، and single port laparoscopic surgery. For booking and information on visiting dates, kindly call 07709000000. 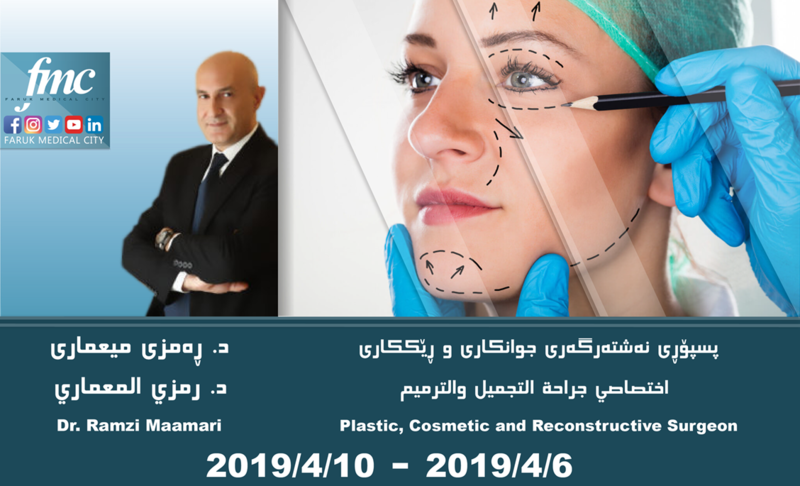 Dr. Ramzi Maamari, plastic, cosmetic and reconstructive surgeon at Bellevue Medical Center – Beirut, will visit FMC in Sulaimaniyah, Iraq from 6/4/2019 until 10/4/2019. Dr. Ramzi has obtained a board in general surgery from St. George’s Hospital in Beirut, Lebanon. In addition to a board in plastic and reconstructive surgery from Carlos Chagas’s Faculty of Medicine in Rio de Janeiro, Brazil. He performs facial and body aesthetic and reconstructive surgeries. Dr. Ramzi is a member of both Brazilian and Lebanese society of plastic and reconstructive surgery, and has a license in plastic surgery from Abu Dhabi Department of Health; he also attended and participated in many congresses and courses in Beirut, Brazil, Cairo and Dubai. For further information and booking, kindly contact 07709000000. 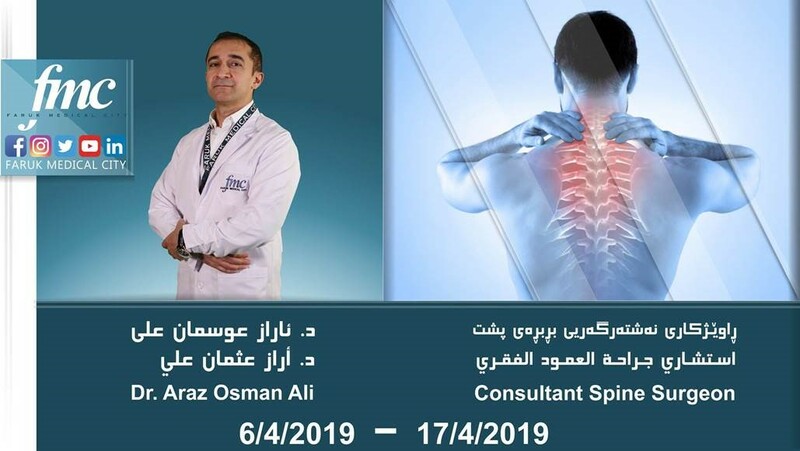 Dr. Araz Osman Ali Barami, A Consultant spine surgeon, practices surgery in Spine Center, Stockholm clinic that is the largest and most complete spine clinic in the Northern Europe. 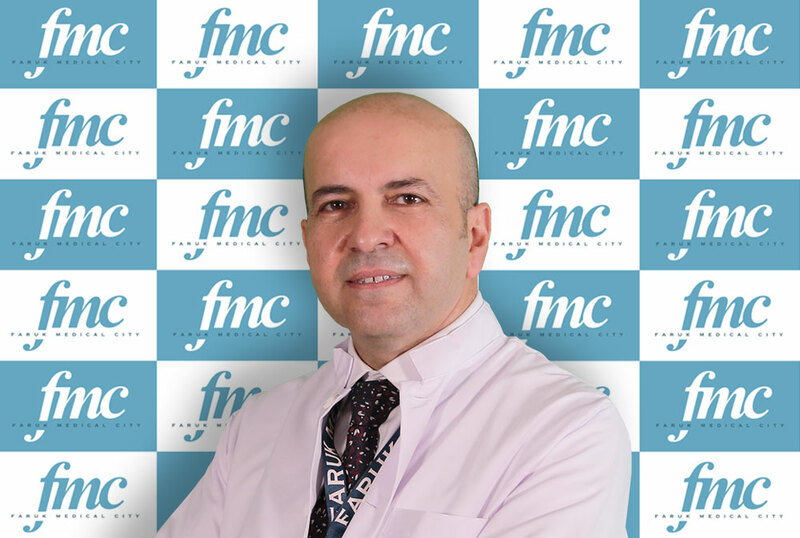 Dr. Araz will visit FMC from 6/4/2019 until 17/4/2019 to examine patients and perform procedures that engages latest technology and minimal invasive spine Surgeries. Dr. Araz obtained a fellowship in spine Surgery at Karolinska University Hospital, Stockholm / Sweden, and a European degree in orthopedics and traumatology (EBOT). He has passed the Orthopedic Examination of the Swedish Orthopedic Association, and obtained the Swedish Board of Orthopedic Surgery. He has also obtained Swedish Spine Master’s degree (Research project in spine surgery). For further inquiry and booking, please contact us on 07709000000 or visit FMC in Sulaimaniyah City. Dr. Teshk Nouri Shawis, Geriatric Medicine Specialist with specialist interest in stroke and orthogeriatics at Colchester University Hospital in UK, will visit FMC in Sulaimaniyah, Iraq from 8/4/2019 until 10/4/2019. 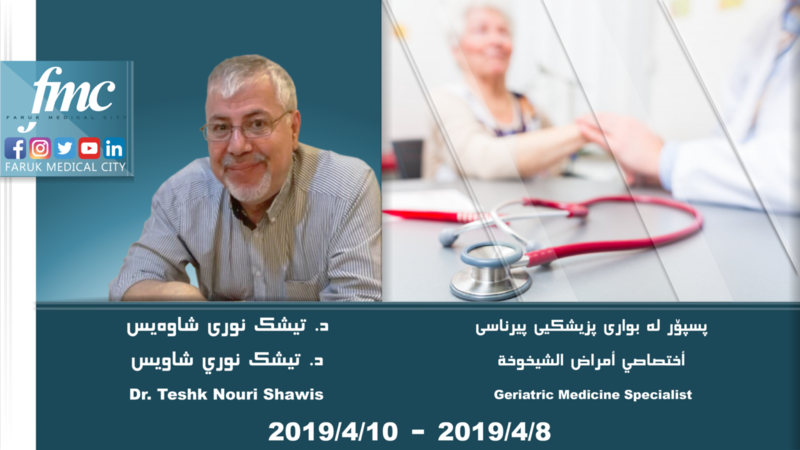 Dr.
Dr. Teshk Nouri Shawis, Geriatric Medicine Specialist with specialist interest in stroke and orthogeriatics at Colchester University Hospital in UK, will visit FMC in Sulaimaniyah, Iraq from 8/4/2019 until 10/4/2019. Dr. Teshk obtained MBChB from Salahaddin University in Iraq, and Leeds Medical School, UK, in addition to a membership with a fellowship from the Royal College of Physicians. Dr. Teshk works currently as Honorary Senior Clinical Lecturer for undergraduates from Bart’s and the London Medical School, and as Honorary Senior Lecturer University of Essex in UK. He has publications, presented papers and abstract in different aspect of care of the elderly mainly cardiology and diabetes in the elderly as well as Osteoporosis and Hypertension. For more information and booking, kindly contact us via 07709000000. 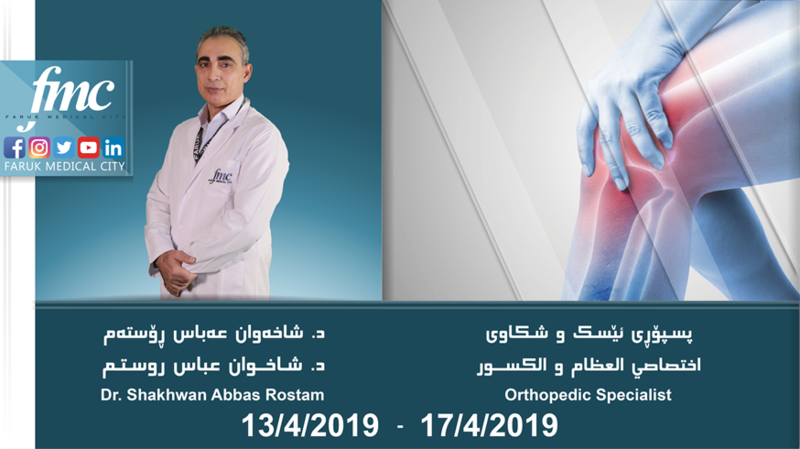 Dr. Shakhwan Abbas Rostam, Orthopedic Surgeon, and specialist in joint diseases and joint replacement operations, will be visiting FMC to examine patients and perform joint replacement surgeries from 13/4/2019 until 17/4/2019. Dr. Shakhawan is specialized in hip and knee replacement and complicated revision replacements, he obtained a Board Certificate from the University of Oslo in Norway, which is the highest specialty certificate in the field of Orthopedic Surgery, and currently works at Stavanger University Hospital in Norway.